A Room should feel collected not decorated ! This Ramadhan we bring you the latest Raya Collections from our “IT" List on Interiorati !!! Don’t miss an opportunity to choose and collect exquisite pieces from one or all these tempting Raya promo offers!!! Here’s our latest round up of all the must have’s in gifting, design trends and home decor this festive season ! 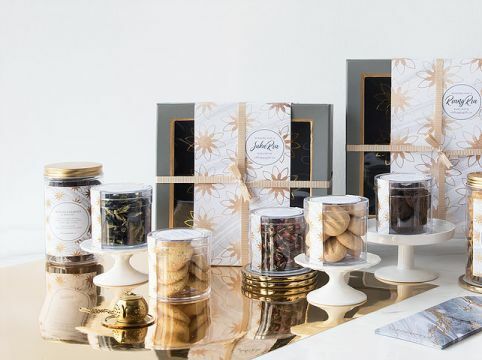 Making your own gift hamper set can be tricky, but luckily Oh Happy Gift has got you covered with their curated gift set exclusive for Hari raya. Get a mix of sweet and savoury delights with the Suka Raya set (RM168) includes with Mocha Cookies by Baked KL, Salted Egg Fish Skin by Hou Sek, Madeleine Cake by Mlune, Rose and Blue Pea loose tea, and also a gold teapot infuser to go with it. While the Riang Ria set (RM188) includes with Honey Caramel and Mocha Cookies by Baked KL, Rosemund Salt and Mak Bedah Fruit Loaf by Mad Treats, and a bottle of sparkling white grape & elderflower by Story. Get this great selection of gifts for yourself or loved ones here. 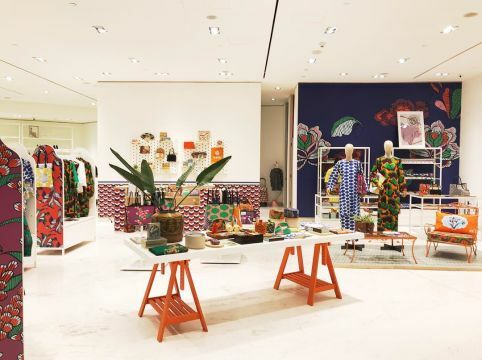 For those that want to stand out and be unique during this Raya, try to get your hands on the Nala Baju Kurung and Songkok which is handmade and hand-drawn with totally colourful patterns that's only available at the newly launched Robinson’s Shoppes at Four Seasons Hotel. 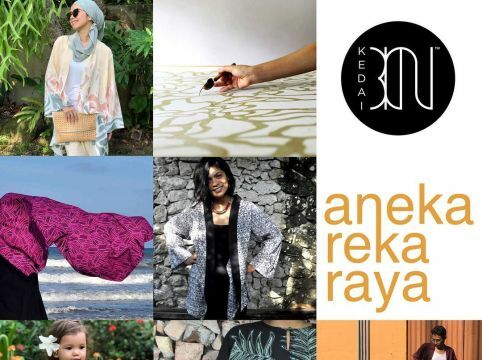 Kedai Bikin presents A Capsule Collection Aneka-Reka Raya their first capsule collection for Eidilfitri this year, Aneka-Reka Raya. Three main artisans with backgrounds in architectural studies take on the traditional batik with their own interpretation to re-create their own designs and identities of the batik. This new breed of young batik artisans mark an important development in Malaysia’s craft industry, along with other established forward-looking brands such as Fern the new Batik and Ruzz Gahara. Dress in style this Raya season with the Novak Batik, Batik Tektura and NysaKapas that will make you look effortlessly stunning at the ‘Kenduri’. 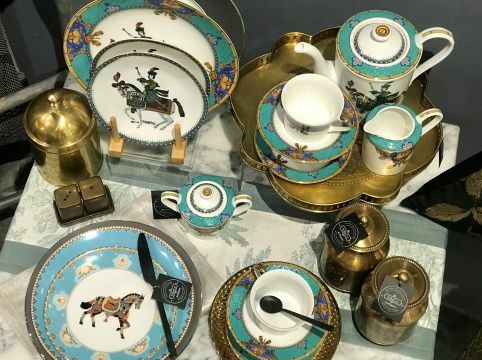 Set your table and serve your Hari Raya feast on these special and exclusive ceramic homeware plates and cups by Bendang Studio. Choose from different styles and colour to suit your decor which your house guests will surely appreciate. Adding to the list of beautifully crafted home-ware is TriBeCa Artisan with their brand new 2018 Eid Mubarak tableware collection which flauts gold lining plates and stainless steel cutlery. Their delightful tea set also goes well on the table with your Raya kuih-muih. Enjoy 10% off on selected merchandise when you follow both of their social media platform - Instagram and FB @tribecartisan Valid from 1st June to 30th June 2018. Space saving solutions, Mocof Furnitures is also running a promotion with them slashing their prices with a 20% discount on retail goods. And on top of that they are also giving away an additional RM1000 cash voucher with every purchase above RM5000*. Ts&Cs apply. Sign-up for FREE on Interiorati.com between 14th May and 3rd June 2018 and instantly receive a FREE Limited Edition Interiorati Hari Raya money packet containing ten (10pcs) each. 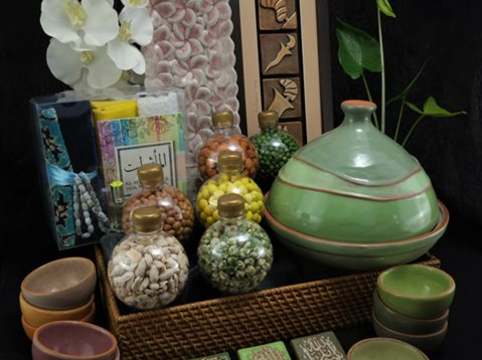 Not only that you could also stand a chance to receive an additional discount gift voucher from the interiorati community for your Hari Raya shopping. Closing date for the freebie is on the 3rd June 2018. After this date no further entries to the competition will be permitted. Money Packets will be sent by Pos Malaysia Standard Mail and given out by the 8th June 2018 to the users' address. The freebie is open ONLY to Residents of Malaysia, except the employees of Interiorati and their close relatives and anyone otherwise connected with the organisation. There is no entry fee and no purchase necessary in order to be eligible to this freebie. The organizer reserves the right to cancel or amend the freebie promotion and these terms and conditions without notice or anticipated breach of any applicable law or regulation or any other event outside of the organizer’s control. Any changes to the promotion will be notified to entrants as soon as possible by the organizer. The organizer is not responsible for inaccurate details supplied to any entrant by any third party connected with this freebie promotion. The freebie promotion is as stated and no cash or other alternatives will be offered. The freebie Hari Raya money packet is subject to availability and we reserve the right to substitute with another freebie of equivalent value without giving notice. The giveaway entrant will be notified by email and/or DM on Facebook/Instagram/Twitter within signing up on Interiorati. The user will be notified when the freebie will be sent out to the user. The organizer’s decision in respect of all matters to do with the freebie promotion will be final and no correspondence will be entered into. Any personal data relating to the users or any other entrants will be used solely in accordance with current data protection legislation and will not be disclosed to a third party without the entrant’s prior consent. Entry into the freebie promotion will be deemed as acceptance of these terms and conditions. The organizers also reserve the right to cancel the competition if circumstances arise outside of its control. This freebie promotion is in no way sponsored, endorsed or administered by, or associated with, Facebook, Twitter or any other Social Network. By signing up and entering this freebie promotion, a user is indicating his/her agreement to be bound by these terms and conditions. The freebie promotion organizer is Interiorati Sdn Bhd (1236256-T) whose registered office is at Level 25, 198 Menara Worldwide, Jalan Bukit Bintang, 55100, Kuala Lumpur.